45 Beverages Ranked by Caffeine Per Ounce #infographic ~ Visualistan '+g+"
If you’re like most people around the world, you enjoy a good cup of coffee or tea daily. It has the “pick-me-up” we need to start our day and stay focused. That pep comes from caffeine, and it’s in a lot more than just our morning cup o’ Joe. If you like soda, there’s caffeine in that. Your late afternoon energy shot? There’s a lot of caffeine in that, too! At the end of the day, all of that caffeine can really add up. If you’re having sleep troubles, you may want to closely examine your daily caffeine intake. Likewise, if you just enjoy the jolt of energy from a morning cup of coffee, you may want to seek out the most potent brew available. 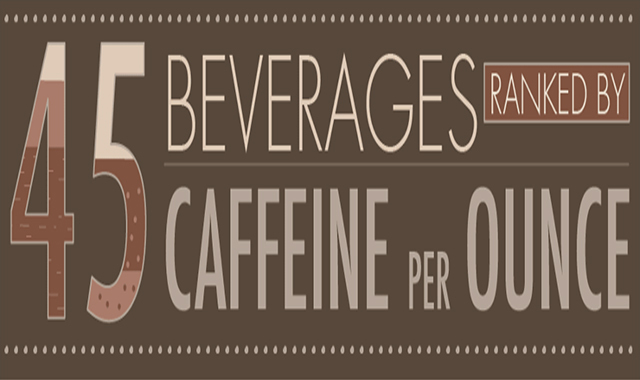 This infographic from the sleep experts at Sleepopolis explores 45 popular caffeinated beverages, and ranks them by caffeine per fluid ounce. From fast food chains, to boutique coffee makers, to popular teas and sodas, you can see how your favorite beverage stacks up in terms of caffeine content.